"Fresh spinach and plenty of ricotta, Romano and mozzarella make this a cheesy and hearty dish. This lasagna can also be made without the spinach." Combine ricotta cheese, Romano cheese, spinach, salt, oregano, basil, pepper, and egg in a bowl. Add cooled mushroom mixture. Beat with an electric mixer on low speed for 1 minute. Lay 5 lasagna noodles in bottom of a 9x13 inch baking dish. Spread one third of the cheese/spinach mixture over noodles. Sprinkle 1 cup mozzarella cheese and 1/3 cup Parmesan cheese on top. Spread 1 cup pasta sauce over cheese. Repeat layering 2 times. 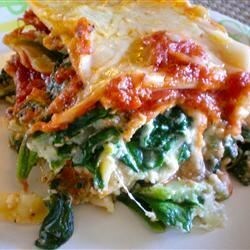 This hearty meatless lasagna is layered with cheese, fresh spinach, and sauce. how do you fit five lasagna noodles in the bottome of a 9x13 pan. This recipe has more noodles than anything else.